Agitations continue in different parts of the state as pending dues of sugarcane touch Rs 7,000 crore. BKU blocks the Delhi-Dehradun railway track in Muzaffarnagar. Image by special arrangement. 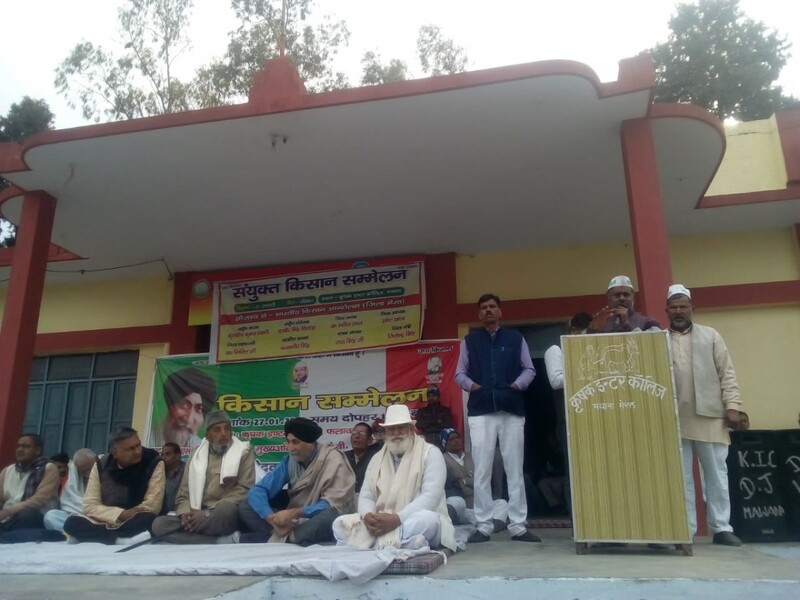 New Delhi: Farmers in Muzaffarnagar were scheduled to meet the district magistrate and representatives of sugar mills on Tuesday over the issue of pending sugarcane dues. But, the representatives did not show up for the scheduled meeting. 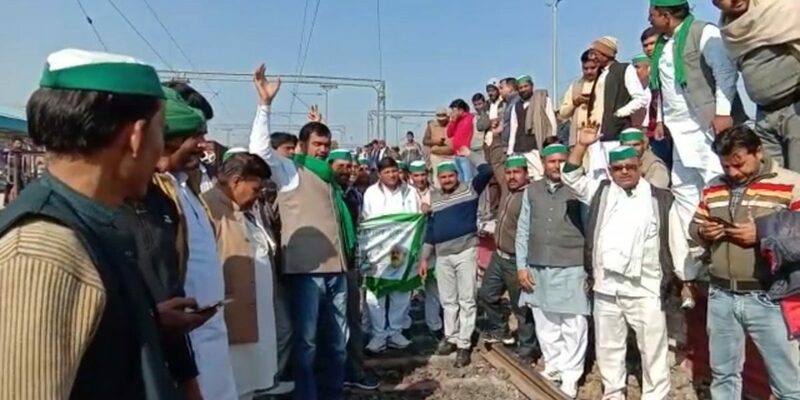 Angry farmers, under the aegis of the Bhartiya Kisan Union (BKU) – which is not known for silent protests – decided to block the railway track in Muzaffarnagar in protest. Even district officials joined the farmers. 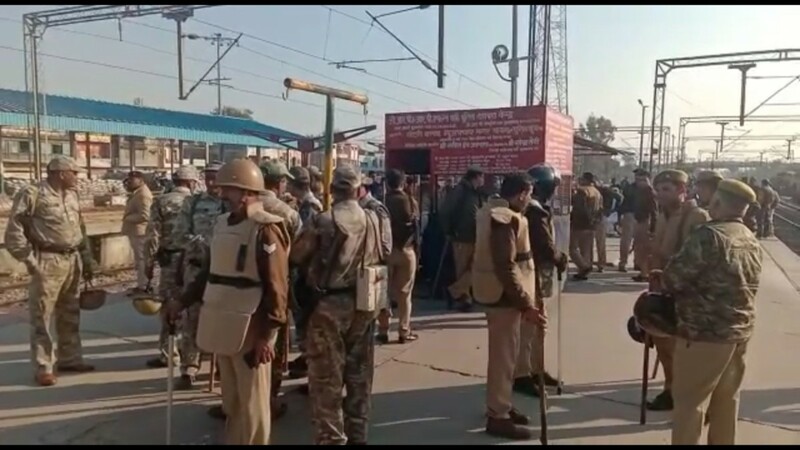 Several trains on the Delhi-Saharanpur-Dehradun track remained stuck for over six hours as the farmers decided to make the railway track their protest spot. Police officials in the western Uttar Pradesh town scrambled to the spot to ensure that the law and order situation does not get out of hand. Finally, the protest broke and the railway track was cleared late in the evening, when the district officials managed to bring the general manager of the concerned sugar mill to the spot. He assured farmers that their dues will be cleared by February 10. Police at the Muzzafarnagar railway station. Image by special arrangement. “There are dues of around Rs 1,000 crore from Muzaffarnagar alone and we were ready to have a discussion with sugar mills on how to move forward to solve the problem. But, they did not show up. What choice did we have? We were not going to remain silent,” said Rakesh Tikait, son of legendary farmer leader Mahendra Singh Tikait, and national spokesperson of the BKU. Tikait also said that if the dues of farmers are not cleared by February 10, the BKU will be launching a state-wide agitation. Three months into the 2018-19 sugarcane crushing season, and sugar mills in Uttar Pradesh have only cleared 47% of the pending dues of farmers. Dues have mounted to Rs 5,720 crore as of January 23. Add to this the Rs 1,260 crore which remain pending for the 2017-18 season, and the total figure for pending dues inches up to Rs 7,000 crore. Compare this with the previous season, 2017-18, when at this time pending dues were Rs 1,800 crore. “This season the situation seems to be even worse than last year. If the season continues like this, we will have Rs 30,000 crore of pending dues by April or May,” said Tikait. Farmers across the state have been protesting as their dues remain unpaid. After a week long seize of the Upper Doab sugar mill in Shamli, farmers have now allowed the mill to function. But, their protest continues at the district magistrate’s office. Kuldeep Tyagi of the Bhartiya Kisan Andolan at a protest in Mawana. Image by special arrangement. On Sunday, the Bhartiya Kisan Andolan staged a protest in Mawana demanding that pending dues be paid immediately. Members of the Rashtriya Kisan Mazdoor Sangathan are on a hunger strike outside the gates of a sugar mill in Shahjahanpur. “Before the UP elections, the BJP promised that it will ensure that dues are cleared within 14 days. The prime minister himself made this promise. The last two seasons we have seen that the BJP’s record is even worse than that of previous governments,” said Kuldeep Tyagi of the Bhartiya Kisan Andolan. The Uttar Pradesh government has reacted and issued recovery certificates against 11 sugar mills in the state. These certificates empower the district magistrates to seize and auction the property of sugar mills to ensure that dues are paid. “But, no action has been taken. FIRs have also been registered against some mill owners but no one has been arrested,” said Tyagi.